Ksport pillowball upper mounts are designed for the Ksport coilover system and improve responsiveness for any application. 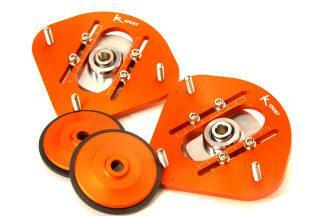 These mounts replace the stock rubber or plastic mounts to reduce flex and improve performance. The angle of the contact patch of the tire is changed improving handling when installed on the coilover. Camber can be adjusted by the pillowball top mount on McPherson applications only saving you time and money.